8th Generation Intel Core i5 / i7 Models available. As technology is developing, we get to see more original laptop models get to hit the market. 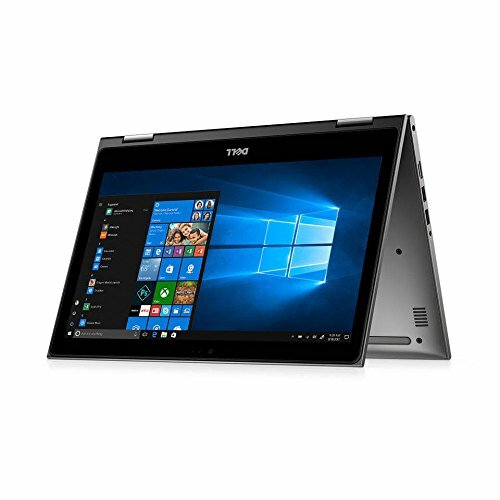 At a reasonable price, Dell Inspiron 13 5000 is an adequate laptop for everyone who is looking for either a laptop and a tablet in one. We wrote this review highlighting main features of this Dell’s champion and will review its main goods and wrongs. If you already pursue a multi-purpose laptop and you can’t make a decision, continue reading through this review, and hopefully, you will decide. Compared to many other two-in-ones, Inspiron 13 5000 houses a design which is very functional. Dell has decided to change the version of silver/gray textures for this Inspiron series. The screen is framed with thick bezels, although its rounded corners are not proportional to the laptop lid which is squared. 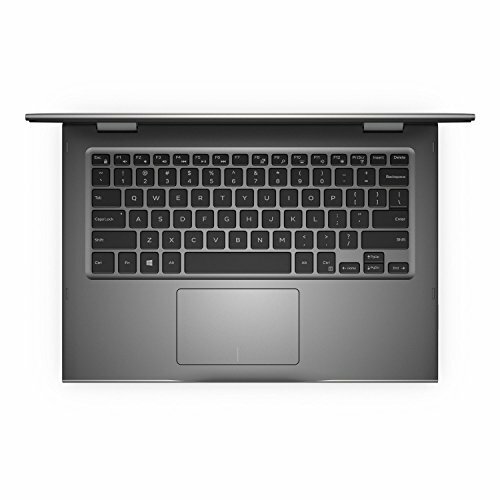 When it comes to the color, the laptop is covered in gunmetal-gray, matte, plastic. At this price range, it’s understandable that the laptop is housed in plastic. Nevertheless, the plastic build doesn’t mean that the laptop is poorly made. Its solid build gives an impression of a durable laptop which is well-crafted. You can effortlessly bend the screen. The tent modes are nice and stable enough. The laptop is mostly silent while bending, although a small creaking sound could be noticed if you don’t pay sufficient attention. Dell Inspiron 13 5000 weighs 3.45 pounds at dimensions of 12.76 x 8.85 x 0.8 inches. Its weight is not too lightweight but neither is too heavy. 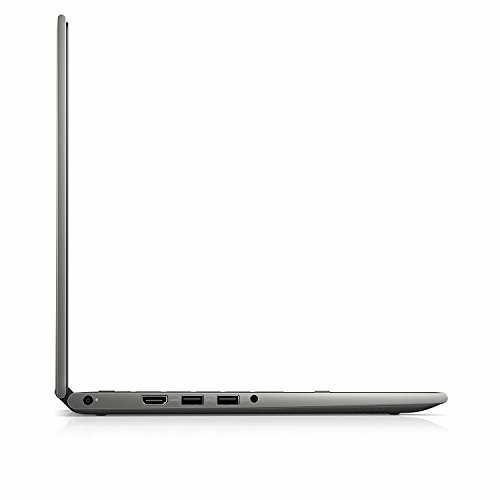 Compared to other laptops, especially Dell’s sibling Inspiron 13 7000 is lighter at 3.4 pounds. You will agree that the Inspiron 13 5000 is quite rich in ports. From the left side we can see two USB 3.1 ports, a 3.5mm audio jack followed by an HDMI external slot. On the other hand, the right side is equipped with an SD card reader, accompanied with a USB 2.0 port and a Noble lock slot. The sub-$800 laptops cannot buy the brightest, most vibrant screen. Inspiron 13 5000 is lacking on both but is equipped with the sufficiently vivid specter of colors to support streaming higher-end of videos and movies. The screen diagonal measures 13.3-inch, while the maximal supported resolution is of 1920×1080 pixels. Nevertheless, the lack of color vibrancy doesn’t also mean that the colors are not sharp, on the contrary. The image is clear and sharp, making this laptop suitable for various other purposes. If you take a look at the recent movie trailers on YouTube, you will notice the mentioned vibrancy but very strong accuracy in colors. Those who have high attention to details can take a look at the details presented in the videos, series, or movies. Still, Inspiron 13 5000 is equipped with wide viewing angles and a panel that won’t get darker if you observe it from the other angle. Unfortunately, though, as the screen is more dim than bright, it will be difficult to use a laptop in the rooms with strong natural light or outside, unless, of course, the brightness is set to 100%. Mid-range laptops can’t always deliver prominent and reliable audio features. However, Dell’s Inspiron 13 5000 exceeded our expectations. The audio output of this laptop was precise, sufficiently clear and respectably detailed. Switching between different musical genders we couldn’t find anything that we would mind. However, only when listening to the Rock music, we would find the sounds of drums to be slightly distorted, but that isn’t any different compared to other laptops that are currently available on the market. Dell allows you to edit and customize the sound output on your laptop with the Waves MaxxAudio application which provides various sound profiles. Furthermore, you can manually adjust the equalizer to sound the way you adjust it to be. As mentioned above, the audio is clear and loud enough to fill up a medium office or a room, although increasing the volume decreases the clarity of the sound. The keyboard of our review unit of Dell Inspiron 13 5000 is quite stiff and uncomfortable for writing. If you spend the most of your days typing by working in Microsoft Office programs and similar, keep in mind that this laptop keyboard is everything but comfortable. There is a lot of key travel of up to 2 millimeters in the competition laptops. However, Dell’s keyboard barely travels 1.1mm. There are low-end laptops with the good tactile response, but Inspiron that we review lacks either key travel and response. Do you write a lot on your laptop? Have a look at our Laptop for Writers buying guide. There is a lot of force applied each time that the keys are pressed, and they hit bottom. If you are a fast typist, you will get used to more errors while typing. If you opt for Dell Inspiron 15 5000, make sure to either type less or use a laptop for different purposes. On the other hand, the touchpad that is sized 4.1 x 2.6-inch is accurate and responsive. It is easy to navigate through the desktop and worked properly on multitouch performance. You will be able to pinch, zoom and swipe with three fingers. Even though it’s accurate and responsive, touch feels as stiff as a keyboard, which makes it unpleasant to use. Maybe if it had buttons, it would be more comfortable. 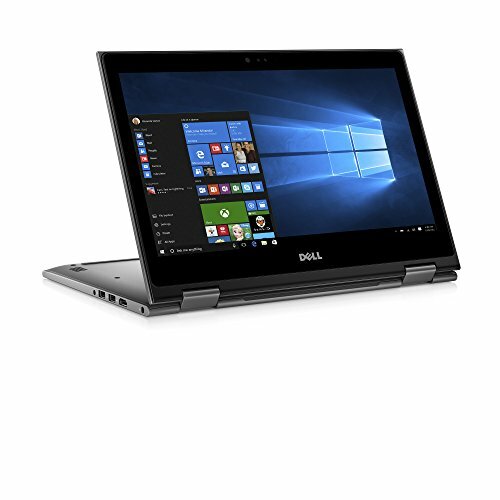 Dell Inspiron 13 5000 is not the richest laptops in features. Its keyboard is stiff and screen dark and dreary. Nevertheless, the prominent audio capabilities and solid build make up for the grade of 3 out of 5. 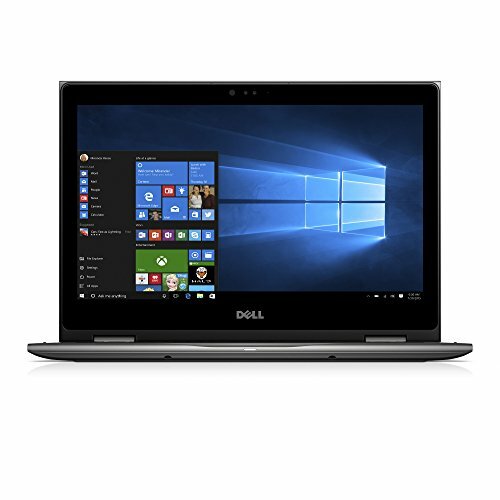 When it comes to performance it varies based on the components Dell Inspiron 13 5000 is equipped with. For instance, a sub-$800 laptop will provide you with a powerful Intel Core i5 of 8th generation i5-8550U chipset, along with 8 GB of RAM which should be sufficient for a laptop to work without hiccups. INFO: If you are looking for an 8th Gen Core i7 Model, view it here. This setting will allow you to watch movies/videos and listen to the music regardless of the mode. Furthermore, it should support playing some games on the lower end of the meter. Thanks to the powerful processor that it is equipped with, it is eligible for programming and office work as well. As about the storage, we were slightly disappointed to notice that the 256GB solid-state drive works rather slowly given its specifications. Solid-state drives are usually placed to replace slow mechanical drives which can contribute to slower accessing and transfer speeds. Here, it took it 45 seconds to move roughly 5GB of files at the rate of 121 MBps, which is over 40% behind the competing machines. Nevertheless, these numbers shouldn’t worry you unless the storage speed is important to you. It’s not rocket science to know that you won’t be able to play top-end games that are taking over the lists now. It is equipped with Intel’s UHD 620 graphics, which enables it to run some casual, not so popular titles. You can get satisfied with some older, popular titles, but not those such as GTA V and similar. If you are a high-end gaming laptop, make sure to check out some of the other models that we previously reviewed. Still, UHD 620 graphics with shared memory will be enough stream videos and watch high-resolution movies without an effort. Its score that it achieved on 3DMark Ice Storm Unlimited is 58.043, which is modest compared to other laptops. If we were reviewing a gaming laptop with a discreet and hungry graphics card, we would be impressed with the 7 hours of ongoing work. However, this portable, office laptop has a mediocre life compared to the competition, although it will efficiently last nearly a full day without the full brightness. That being said, you’ll be able to take it out for a walk to a library, café and office and have reliable 7 hours at your service. We were satisfied with the thermal protection Inspiron 13 5000 had to offer. It felt comfortable to use despite streaming a full HD video for 20 minutes, which resulted in a temperature of 79 degrees Fahrenheit at the touchpad while the keyboard hit 93 degrees. Still, the bottom was slightly hotter at 100 degrees Fahrenheit. The laptop has reliable and consistent performance, earning a 4 out of 5. While the appearance might appear slightly mediocre, it’s pretty solid, while the reliable performance will serve you at any time. We believe that this laptop is worth the money, although its screen and keyboard are slightly disappointing for this budget. The two-in-one laptops are getting enormously popular. Dell Inspiron 13 5000 offers more than reliability if you are willing to sacrifice modern look of an ultrabook for top-end performance. The laptop isn’t suitable for gaming, nor does it keyboard offer enough consistency for writers. 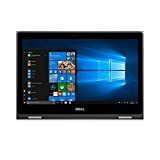 Dell Inspiron 13 5000 laptop is a compact portable multi-purpose laptop with unattractive but solid state, dark screen and slightly stiff keyboard. Nevertheless, it offers solid performance, relatively respectable battery life and audio that is either efficiently loud and offers clarity. Danica is a student of Applied and Computer physics with great passion to gaming, technology and science. She's spent a valuable amount of time researching and testing gaming laptops that can suffice the dreams of all ranges of gamers. Her hobbies are gaming, reading, writing, and drawing.